Cox Automotive Canada's Grace Kong hosted panel discussion that included Leanne Kripp of Kijiji, Helen Fotinos of Dentons Canada and Mary Liptay of The Great Northern Auction during the Women With Drive event. Photo courtesy of Cox Automotive Canada. Cox Automotive continued to build its Women With Drive initiatives across the globe in celebration of the work women accomplish in the automotive industry every day. This past Monday, more than 125 company employees gathered together at the Mississauga Convention Centre for Cox Automotive Canada’s fourth Women With Drive event. The company described the initiative as an inclusive movement built to support female successes and aspirations. The afternoon began with a team lunch, followed by a motivating keynote presentation from Janet Barnard, executive vice president and chief people officer at Cox Automotive. — Establish your own board of directors. — Find advocates and mentors. — Select those with your best interests at heart. — Don’t be afraid to show your true self. — Have a higher purpose. After Kong offered personal insights into what it means to make rewarding career choices, while choosing to champion equality in and out of the workplace, the panelists spoke about the importance of further developing and supporting women during the Q&A session. Cox Automotive Canada mentioned The Second City Works led an interactive experience to round out the afternoon. Famous for crafting events that are interactive, educational and hilarious, The Second City Works provided Cox Automotive Canada team members with a crash course in improv as a tool for better collaboration, innovation and agility. “With the goal of continuing to strengthen and inspire the workforce, Cox Automotive Canada’s latest Women With Drive event looked to empower team members — male and female alike — while also aiming to inspire improvement and drive personal growth,” the company said. 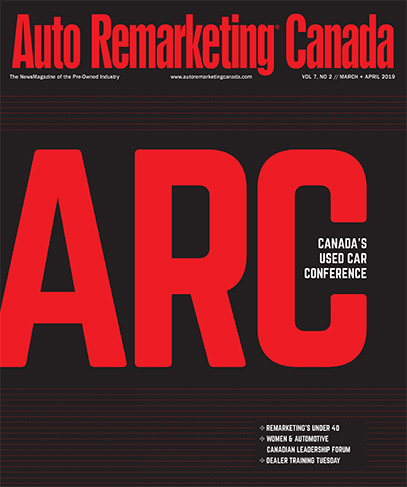 Cherokee Media Group also continues to build momentum with a similar event — Women & Automotive Canadian Leadership Forum — which unfolds immediately after the Auto Remarketing Canada Conference. The Women & Automotive Canadian Leadership Forum will return to the Westin Harbour Castle in Toronto on March 21. More details about the event can be found at www.womenandautomotive.com.